Soften and unwind with Katie for 2 hours of restorative yoga. Restorative yoga is a deeply relaxing, therapeutic style of yoga. To begin, we will settle the body and mind with some mindful movement and gentle pranayama. 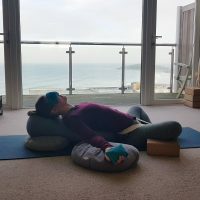 Then, you will be guided into several deliciously floor-based restoring poses, placing your body as comfortably as possible with the help of bolsters, blankets and props. Each pose will be held for about 10 minutes or for as long as is comfortable. When the body is in a state of deep comfort, the mind is encouraged to sink into a state of profound rest, releasing deep-seated layers of tension and stress in the body and mind. We will finish the class with Yoga Nidra, or Yogic sleep, an ancient form of guided mediation. The perfect reset to welcoming the New Year and suitable for everyone, beginners included!